Congratulations on your engagement! And now, the planning for your wedding begins. Since a wedding is something that you dream of, you want everything to be perfect without becoming a Bridezilla or Groom Kong for having a lot of wedding preparations and arrangements. Everything can get overwhelming as your big day is approaching. So, to keep things in order and systematized, you need to have a wedding timeline that serves as your guide in your preparations months before the wedding and even during the day of the wedding. To help you in creating an ideal timeline, presented in this article are awesome examples and templates of a wedding timeline that will keep the romance alive even with those busy preparations and hectic schedules. 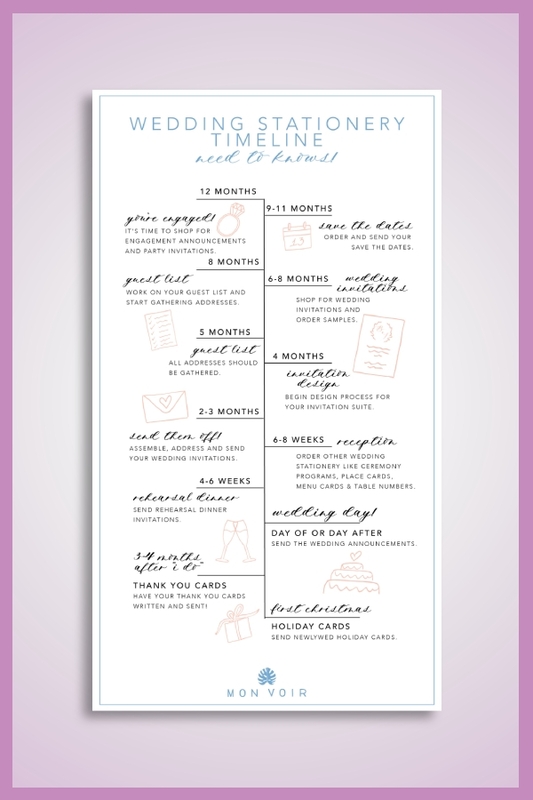 This simple wedding timeline template can be used for planning the things you need to do during the wedding day. This will keep you sane and not going frantic and will prevent you from missing any small details that you need to attend to before the wedding ceremony. 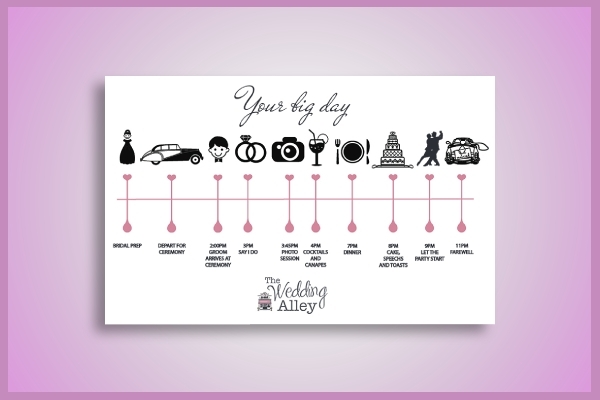 Hence, in order to set things in place before your much-awaited moment, fix your schedule now and create a timeline with the use of this wedding timeline template which is easily downloadable and editable. 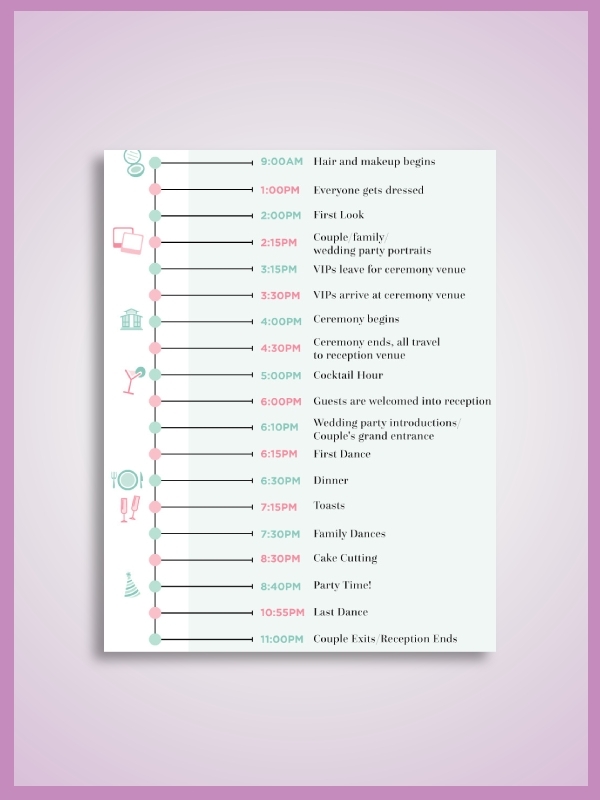 You can personalize this template to fit your preferred schedule for your wedding day. You are guaranteed with high-quality graphic designs because this is crafted by professional designers and graphic artists. We know how busy you are in your wedding preparations. Apart from the bookings and reservations, you also need to create your invitations and RSVP cards. Moreover, you need to comply with the legal documents that are necessary for your wedding. You need to accomplish all these obligations and responsibilities within a short period of time, so this could be very overwhelming. Similarly, on the wedding day, because both of you are very much excited about this memorable moment, you may get out of the track with the necessary preparations during the wedding day. 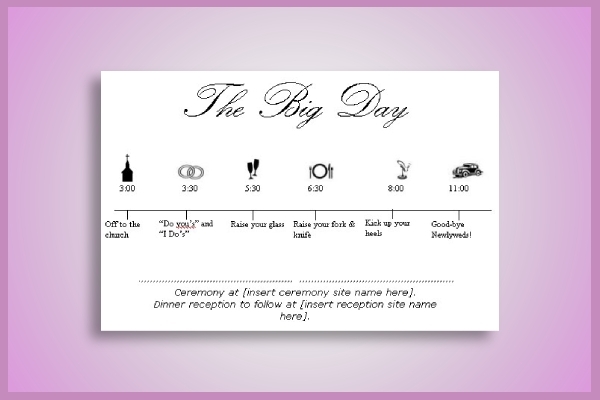 So, to help you remember the things you need to do, this detailed wedding timeline example may help. It presents every task that you need to do and serve as a to-do list along with the respective time schedule for that certain task. A lot of couples find themselves getting stressed on the day of their wedding. Instead of enjoying this very special day, they are worrying that there might be other things that they missed in their preparation. 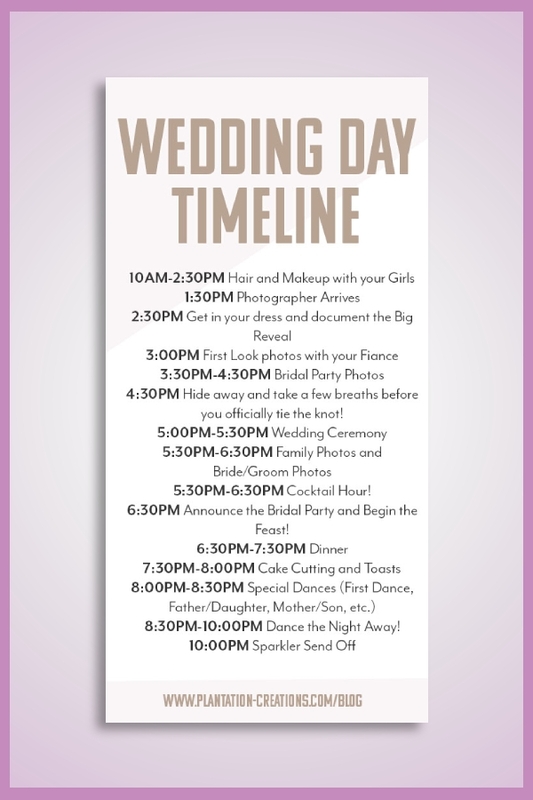 So, in order to prevent the hassle, you may refer to this basic wedding day timeline. The details include the time of the hair and makeup, the time when the photographer arrives, the time to get in your dress and document the big reveal, and a lot more until the end of the wedding day. So when you create your own timeline, brainstorm ahead of time to include even the smallest details to avoid cramming when your wedding day arrives. This is an example of a well-detailed plan for the wedding preparation 12 months before the wedding day. In this example, 12 months prior to the wedding, you need to shop for engagement announcements and party invitations; 9–11 months is the perfect time to send your wedding save-the-date cards; 6–8 months is the time to create a guest list and to shop for wedding invitations; 2–3 months is the sending of invitations and RSVPs; 6–8 weeks must be for ordering other wedding stationery like place cards and menu cards; 4–6 weeks is when you send dinner rehearsal invitations; and last but not the least is the wedding day, the day to send the wedding announcements. Graphics and illustrations aid readers to immediately understand the text. Just like in this example, apart from the text below the line that represents the time of the day, an illustration is placed above corresponding to the text. A church clip art is used to signify that this is the time when you have to start traveling to the church; rings for the exchange of vows; wine glasses for the tossing of wine; plate, spoon, fork, and knife for the start of the dinner party; heels, which means kicking them off for the after-party; and car, which means sending off the newlyweds. You can create your own version of this timeline and choose a clip art that best corresponds to each task that you need to do. 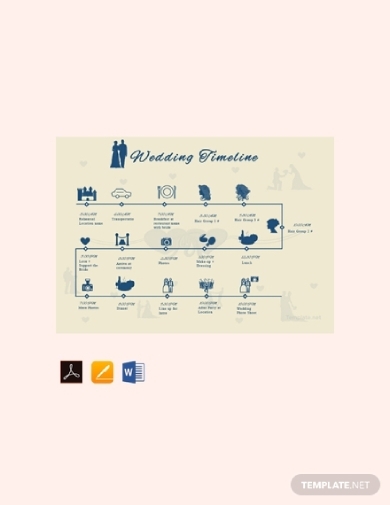 Similar to the previous example, this organized wedding timeline presents an illustration of the timeline that you need to follow during your wedding day. You must keep your timeline organized and make sure that you did not miss any important detail that you do not want to regret after your wedding. Referring to this example, the timeline includes the following: bridal preparation, departure for the ceremony, arrival of the groom at the ceremony, saying of vows, photo session, cocktails, dinner, speeches, toasts, party, and couple’s farewell. A simple image can be found above the task, which corresponds to that certain task. So, when your big day is coming, make sure that everything is set and organized by making a wedding timeline that provides the details of your plans and schedules.